Please join us for one or two loop run around Protected content . After our run we will go for dinner at a place of our choosing. Please come walk or run with us! * We most likely all run at different paces, some fast, some slow, some super-fast and some super slow but we all get there in the end. 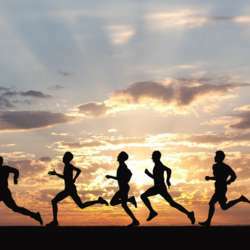 * No one is expected to stay with the group at all times, its best that you run at a pace that works best for you. We will start together but may not end together.